In a fugue of gestural restraint and release combined with unusual mergers of material Berlin-based artist Michaela Zimmer confronts us with rethinking the idea of the abstract painting. She filters the fundaments of abstraction through the syntax of performance, physical reaction and process. Voiding her artwork of classic subject matter she puts application and cancellation to generative use and finally brings about paintings that are as much defined by what they are not and what they hold back as what they are. 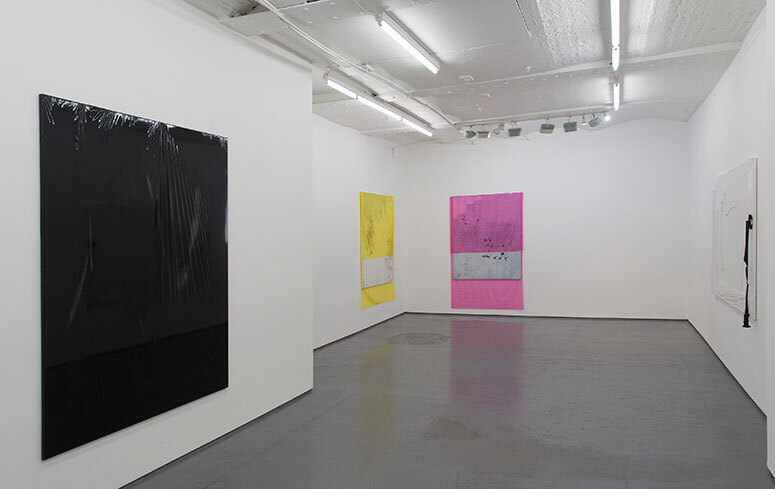 In Zimmer’s current show at FOLD Gallery, London, we see recent works featuring canvases that have synthetic material draped over them with plastics stretched and twisted around corners as well as works with PE film melding into canvas and paint. The artist opens up the classic notion of the abstract painting by adding a performative and material approach to it. She highlights the directness and immediacy of human mark making and combines that with the mediating effects of a constructed, textured underground. Plastic foil combined or merged with canvas is the unusual foundation on top of which she employs an array of techniques – including rolling, dripping, dragging and spray-painting. This intense and visceral process finally emerges as both substance and subject of the work, a reproduction of the contingencies of life and change. Looking at her work it becomes clear that Michaela Zimmer consistently undermines composition, style and the typical gesture; she rather experiments with expressing the flow of the creative process and its inherent inexpectancies. Coincidences are part of the fabric of pictorial composition and are played off against each other in order to achieve unforeseen beauty. And even if these paintings seem to be done in a flying, airy mood, the fact is – they’re rather a result of a very solid feeling of what to add and what to leave aside. They are as much about something as they are about nothing. Being primarily process and performance based, Zimmer’s approach to painting is quite unpredictable. When she is ready, she sets to work. Sometimes a simple line of spray paint or a rolling of a structured surface on the canvas will suffice – the artist works at the limits of painting and she works with paintings that are sometimes not even really painted. Meditative and sensual, the act of painting is reduced to its simple constituents, the sometimes invisible atoms of information of a whole which it wishes to convey.